Victorian-era London. Teenager Felicity Cole worries constantly about keeping herself and her brother alive. Orphaned and penniless, she survives by selling flowers in the market. Her biggest fear is that her little brother Nathan is Tainted–a term denoting special powers that are viewed with suspicion by the general population–and so she keeps him hidden. Her own mother was killed by an angry mob, and there are many similar stories of the deaths of other Tainted people and an underground group of others, called the Huntsman, who are dedicated to wiping them from the earth. Much to her horror, one day Felicity finds herself in a terrible situation and realizes that she herself has supernatural powers. She is rescued by a stranger and taken to a place where Tainted as trained in service to the Crown–as trained assassins. There she must learn to harness her new gifts of speed, agility, and strength. She has other barriers to overcome though. Most of her fellow students are upper class, and they openly look down on her humble origins. She herself has a hard time learning how to behave in polite society, with its lists of acceptable manners and behaviors. But long before she’s ready, she finds herself thrust into danger. The Queen’s Golden Jubilee is approaching, and there’s a terrorist plot underfoot to disrupt the festivities. Felicity is going to need all her street smarts if she’s going to nose it out and stop it in time, but she’s beginning to suspect that one of the people in her program isn’t all they claim to be! 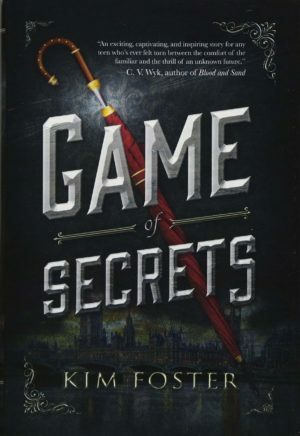 Game of Secrets is a really fun read. I thoroughly enjoyed author Kim Foster’s other series–the AB&T novels–and this one is a start of an exciting new series. I’ve been recommending it to people right and left, and I’m hoping to read more of Felicity’s adventures on the future. While it would classify as young adult, it’s good for all ages. Highly recommended.